Spermatogenesis is a tightly controlled, multi-step process in which mature spermatozoa are produced. Disruption of regulatory mechanisms in spermatogenesis can lead to male infertility, various diseases of male reproductive system, or even cancer. 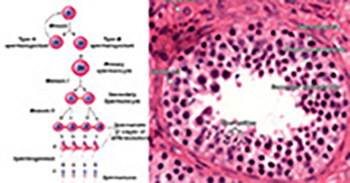 The spermatogenic impairment in infertile men can be associated with different etiologies, and the exact molecular mechanisms are yet to be determined. MicroRNAs (miRNAs) are a type of non-protein coding RNAs, about 22 nucleotides long, with an essential role in post-transcriptional regulation. miRNAs have been recognized as important regulators of various biological processes, including spermatogenesis. The aim of this review is to summarize the recent literature on the role of miRNAs in spermatogenesis, male infertility and reproductive cancers, and to evaluate their potential in diagnosis, prognosis and therapy of disease. Experimental evidence shows that aberrant expression of miRNAs affects spermatogenesis at multiple stages and in different cell types, most often resulting in infertility. In more severe cases, dysregulation of miRNAs leads to cancer. miRNAs have enormous potential to be used as diagnostic and prognostic markers as well as therapeutic targets in male infertility and reproductive system diseases. However, to exploit this potential fully, we need a better understanding of miRNA-mediated regulation of spermatogenesis, including the characterization of yet unidentified miRNAs and related regulatory mechanisms.